The OpenCAPI Synthesizable VIP is compliant with OpenCAPI TL V3.0, V3.1 and V4.0, OpenCAPI DL V1.0 and V1.5 Specifications and verifies OpenCAPI interfaces. OpenCAPI is build on top of it to make it robust. 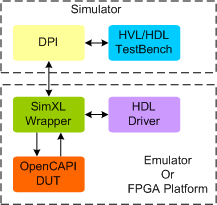 OpenCAPI Synthesizable VIP provides a smart way to verify the OpenCAPI component of a SOC or a ASIC in Emulator or FPGA platform. OpenCAPI Synthesizable VIP is developed by experts in networking, who have developed networking products in companies like Intel, Cortina-Systems, Emulex, Cisco. We know what it takes to verify a networking product.